Your goal is not to adopt Scrum. The goal is to increase your agility while using Scum as a vehicle. Scrum has proven to be effective but companies often encounter severe challenges with its adoption. Why is this? The common reasons given include problems with the team or management or insufficient commitment in time, money or determination. At Net Objectives, we believe otherwise. After using and teaching Scrum for two decades, we see the root cause of challenges with Scrum adoption lie in how it is promoted and the ways in which it is adopted. Scrum is often promoted as the answer instead of as part of the solution. And it is approached as something that is “simple to understand, but difficult to master” and therefore takes a long time to adopt. The reality is that it is not Scrum that is difficult to master, it is that the practices that need to be folded into Scrum that are. 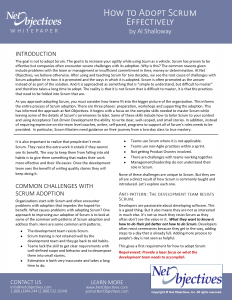 This article describes highlights from a whitepaper, How to adopt Scrum effectively. Download the whitepaper (PDF) to read the complete details. As you approach adopting Scrum, you must consider how teams fit into the bigger picture of the organization. This informs the entire process of Scrum adoption. There are three phases: preparation, workshops and supporting the adoption. This has informed the approach at Net Objectives. It begins with a focus on the complex skills needed to master Scrum while leaving some of the details of Scrum’s ceremonies to later. Some of these skills include how to tailor Scrum to your context and using Acceptance Test-Driven Development the ability to write clear, well-scoped, and small stories. In addition, instead of requiring expensive on-site team level coaches, online, self-paced, programs to support all of Scrum’s roles needs to be provided. In particular, Scrum Masters need guidance on their journey from a two-day class to true mastery. It is also important to realize that people don’t resist Scrum. They resist the extra work it entails if they cannot see its benefit. The way to keep them from falling into old habits is to give them something that makes their work more effective and their life easier. Once the development team sees the benefit of writing quality stories they will keep doing it. Organizations start with Scrum and often encounter problems with adoption that impedes the hoped-for benefit. What causes problems with adopting Scrum? One approach to improving our adoption of Scrum is to look at some of the common anti-patterns of Scrum adoption and address them. Here are some common anti-patterns. The development team resists Scrum. Scrum training is not retained well by the development team and they go back to old habits. Teams lack the skill to get clear requirements with well-defined scope and behavior and to decompose them into small stories. Estimation is both very inaccurate and takes a long time to do. Teams use Scrum where it is not applicable. Teams use non-Agile practices within a sprint. Not getting Product Owners involved. There are challenges with teams working together. Management/leadership do not understand their role in Scrum. None of these challenges are unique to Scrum. But they are all are a direct result of how Scrum is commonly taught and introduced. What is required to overcome these anti-patterns? Upon examining these anti-patterns in Scrum adoption, we can identify a number of requirements to overcome them. Net Objectives has a three-phase approach to address these requirements in an affordable way. Prior to the workshop Workshop leaders meet with management and team leaders to make sure the they understand what approach is appropriate to the team(s) involved (Scrum, Kanban and/or a blend). A short overview of Scrum, Agile and Lean should be presented so management and team leaders will understand what their teams are learning and why. During the workshop Organize the workshop around the team, not just the Scrum Master role. The core of the Scrum Framework intermixed with Kanban as necessary. Lean concepts of flow, quick feedback, systems-thinking and managing work in process with a focus on finishing. Coaching in Acceptance Test-Driven Development with Behavior-Driven Development using the “Given-When-Then” construct. This sets the stage for test automation when the team is ready for it. The purpose of collaboration between the Product Owner and the team is not just so that the team can be clear about what the PO wants, but that the entire Scrum team can be clear about what the customer needs. After the workshop On-the-job Scrum Master training so inexperienced Scrum Masters don’t have to rely on a dogmatic interpretation of Scrum or rely on figuring out tough situations on their own.